Radiocarbon dating is one of the most widely available and applied techniques to develop Late Quaternary chronologies of many ecosystems and is, thus, utilized in Quaternary studies, archaeology, hydrology, geomorphology, palaeoanthropology, palaeoclimatology, palaeoecology, palaeontology, and isotope analyses. A manual literature review search of published radiocarbon dates from eastern Africa was undertaken to store these data in the open-access format and included in the Canadian Archaeological Radiocarbon Database. Dates ranged from 57,804 to 0 14C years Before Present. The format of the database permits expansion of the dataset in the future and permits local, regional and global scale analyses of radiocarbon dates. This paper expands on some of these potential research areas and promote archiving of African data. Increasingly, the ecological palaeoecology approach (Birks 2012; Rull 2014) is being applied to provide long-term contexts to modern ecological, human-environment interaction, conservation studies and land management policies (Willis & Birks 2006; Gillson & Marchant 2014). Geochronological information is critical to understanding past changes in ecosystem compositions and distributions, landscape ontogeny, and to characterize historical baselines of variability to inform management, conservation, and remediation efforts. Geochronological information permits analyses of the variability and rates of change to Earth system processes, including climate, ecosystem changes, evolution, phylogenies, and constraining the interactions between ecosystems and human modifications, across multiple spatiotemporal scales. Radiocarbon dating is one of the most widely available and applied techniques to develop Late Quaternary chronologies of many ecosystems (Libby 1946; Arnold & Libby 1949; Libby et al. 1949; Anderson & Libby 1951; Trumbore 2000) and is, thus, utilized in Quaternary studies, archaeology, hydrology, geomorphology, palaeoanthropology, palaeoclimatology, palaeoecology, palaeontology, and isotope analyses. Within these scientific disciplines, radiocarbon dates are often reported alongside publication literature but have only recently begun to be collated into regional (Fyfe et al. 2008; Gajewski et al. 2011) and global databases (Gajewski et al. 2002, Marchant et al. 2002; Gajewski 2008; Grimm 2008; Power et al. 2008). Data repositories improve accessibility for research across multiple disciplines and to other interested groups outside of academia (Brewer et al. 2012; Grimm et al. 2013). Additionally, databases are useful as educational and professional training tools (Courtney Mustaphi et al. 2014; Goring et al. 2015). 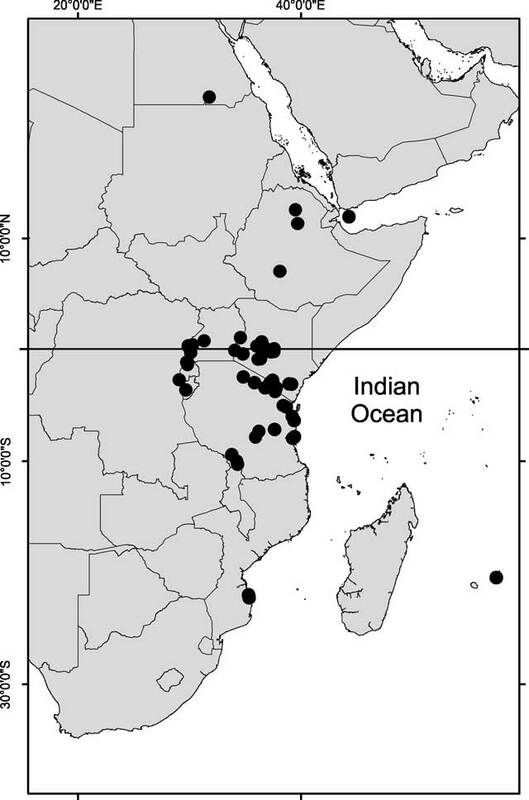 An accessible archive of published radiocarbon dates from eastern Africa is necessary for robust syntheses of multi-site and large spatial scale analyses of palaeoenvironmental sites (Daniau et al. 2010), data-model intercomparison (Braconnot et al. 2012; Marlon et al. 2015), and to provide a tool for investigating past human demographics (Gayo et al. 2015; Chaput et al. 2015). Empirical data of past environmental conditions are a critical resource for constraining model outputs of projected future change within the Earth system. Depositional environments in eastern Africa. Description: Burundi, Egypt, Ethiopia, Kenya, Tanzania, and Uganda, Malawi, Mauritius, Mozambique, and the Gulf of Aden. The spread of radiocarbon dates ranged from 57,804 14C yr BP to modern radiocarbon ages (1950 common era; 0 calibrated years BP). BP, before present. A manual literature search was conducted and published radiocarbon dates were entered from palaeoenvironmental studies, including palaeoclimatological, palaeoecological, environmental archaeology and palaeontological sources. Dates were collected from geologic (carbonaceous sediments, plant macroremains); anthropogenic (hearths, fire pits, and pottery); and faunal remains (eggshell, bone, dung). Other sources of dated material are noted in the data files. Dates from study sites required published coordinates and details pertaining to common radiocarbon dating reporting, such as laboratory code identifiers, radiocarbon ages and errors (Stuiver & Polach 1977; Van der Plicht & Hogg 2006; Millard 2014). The vast majority of dates were entered in the database manually from tables in published literature or data sources. The data upload template has minimum requirements, including the identifier code supplied by the laboratory, the material dated, geographic coordinates, and the radiocarbon age with associated 1σ dating error. Conforming to CARD criteria, publications that did not present radiocarbon laboratory identification codes were assigned as ‘LUNK-000’ or ‘LLUNK-000’ that can be updated in the future (n = 6). In cases where the δ13C values were not recorded alongside radiocarbon dates (n = 392), the values were estimated as: –27‰ for peat, bulk sediment, picked organic samples, and dung; –25‰ for wood and charcoal; –10‰ for bone apatite; and 0‰ for marine shells and foraminifera. These values can also be updated if needed and are noted as assayed, estimated, or measured. Modern radiocarbon dates were inputted as 0±0 14C yr BP and users are referred to the data source reference. Used the data input template (version 1.3; 29 September, 2015) of the CARD 2.0 database. Radiocarbon dates (n = 793) were tabulated primarily from geologic settings (n = 763), archaeological (n = 23) and palaeontological (n = 7). Sixty eight study sites were examined encompassing 70 published papers. Modern radiocarbon dates were assigned as 0±0 14C yr BP (n = 21). The majority of geological dates were from Kenya and Tanzania (Fig. 1). Most of the dates obtained were from the late Holocene (Fig. 2). Dates were dominantly from studies of lacustrine and palustrine sediments and fewer dates from soil, cave, fluvial or marine depositional settings. Dated samples of biogenic material such as charcoal and bone that were manipulated by human agency were assigned as archaeological. Faunal remains that were naturally deposited were classified as palaeontological. Map of eastern Africa and the locations of published radiocarbon dates presented in the dataset. 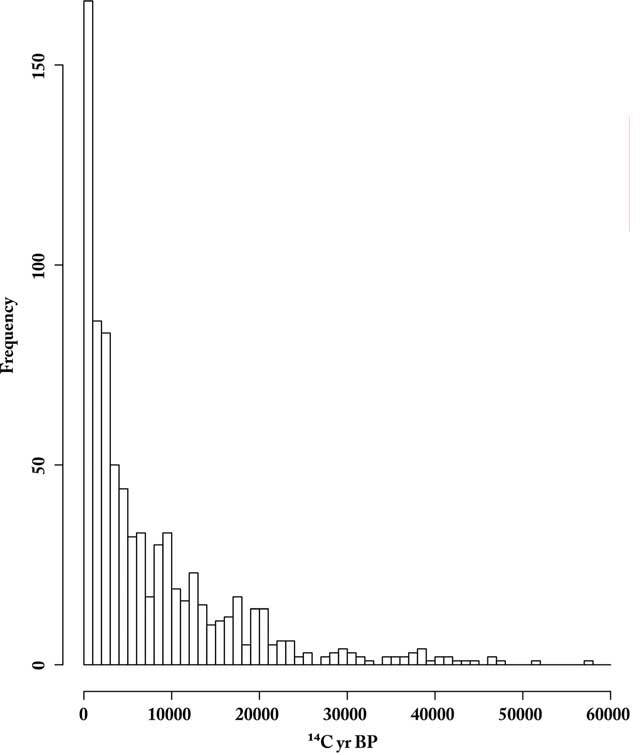 Histogram of uncalibrated radiocarbon dates in the dataset in 1000-year bins. Collated secondary data with references to publication sources. MS Office 2010 Excel file (.xlsx) and identical version as a .csv file (Courtney Mustaphi, 2016). The data was collated in this format beginning 30 August 2015 and ended 6 February 2016. Colin J. Courtney Mustaphi, researcher, University of York. The dataset is available from Harvard Dataverse under a CC0, Public Domain Dedication. The CARD database version requires registration and webpage login for access as part of the global database. The Canadian Archaeological Radiocarbon Database (CARD) was developed as a repository and database for querying archaeological, geologic and paleontological sites and is now a global database (Morlan 1999). An East African Radiocarbon Database developed at York Institute for Tropical Ecosystems has been formatted to port into CARD2.0. It is freely available at http://www.canadianarchaeology.ca. Extremely few radiocarbon dates from Africa are stored within available databases (Chaput & Gajewski in press) and most dates pertain to cultural artefacts and not environmental sources that are useful for palaeoenvironmental and palaeoecological querying. Here we present nearly 800 reported radiocarbon dates from eastern Africa, primarily derived from palaeoecological studies and encourage expansion by the palaeoecological, palaeontological and archaeological research communities with an interest in African climate, ecology, people and landscapes. These data were compiled as part of ongoing work to collect palaeoenvironmental proxy data from study sites across eastern Africa and formatted to be shared via the global CARD database and website interface. This is especially important as few radiocarbon dates from Africa are readily available and here we present an initial fraction of the published dates from Africa. The database can be expanded as additional researchers contribute. These data can be used to examine environmental patterns of change across the region in the past (McClure 1976), including erosion and sediment accumulation rates (Goring et al. 2012; Crann et al. 2015), and past demographics using dated cultural material (Chaput et al. 2015). Sediment accumulation rates in fragmentary and non-sequential depositional systems, such as fluvial, colluvial, and turbidite environments may need further scrutiny due to the complexity of reworking, depositional hiatus, and instantaneous events (Chiverrell et al. 2009). Furthermore, caveats have been identified for the use of radiocarbon dates as potential proxies of ancient population numbers and this remains an active topic in archaeology (Shennan et al. 2013; Timpson et al. 2014; Attenbrow & Hiscock 2015; Brown 2015). Individual studies will require scrutiny of the radiocarbon data applied to investigate past demographies and substantiate the use of such proxy data (Torfing 2015). Palaeoenvironmental data continues to be accrued into various repositories and databases but all rely on baseline geochronological data. To improve reproducibility and data sharing, we suggest explicit presentation of stratigraphic and geochronological controls in papers so that age-depth models can be reconstructed. We present the CARD2.0 database as a useful and readily accessible repository for radiocarbon age determinations from studies in Africa and hope to expand upon these initial samples with further effort in the research community for open-access use. It is foreseeable that there will be increasing global requirements for databased and referenced palaeoenvironmental data from multiple user groups across multiple disciplines in ecology, conservation, land management, policy, palaeoecology, environmental modeling, anthropology, archaeology, sedimentology, geochronology and education (Kriegel et al. 2010; Brewer et al. 2012; Marchant and Lane 2015). We thank Richard Morlan and Andrew Martindale for developing and maintaining the CARD 2.0 database. We thank all participants of the PAGES LandCover6k working group on land cover and land use in East Africa hosted by the British Institute in Eastern Africa, Nairobi, Kenya (22–23 October, 2015). Birks, H J B (2012). Ecological palaeoecology and conservation biology: controversies, challenges, and compromises. International Journal of Biodiversity Science, Ecosystem Services and Management 8: 292–304. Chaput, M A and Gajewski, K (). Radiocarbon dates as estimates of ancient human population size. Anthropocene, DOI: https://doi.org/10.1016/j.ancene.2015.10.002 (in press). Courtney Mustaphi, C J (2016). Radiocarbon dates from eastern Africa in the CARD2.0 format In: Harvard Dataverse, DOI: https://doi.org/10.7910/DVN/NJLNRJ V5. Courtney Mustaphi, C J, Rucina, S M and Marchant, R (2014). Training in emerging palaeoenvironmental approaches to researchers on the dynamics of East African ecosystems. Frontiers of Biogeography 6: 169–172. Gajewski, K, Muñoz, S, Peros, M, Viau, A, Morlan, R and Betts, M (2011). The Canadian archaeological radiocarbon database (CARD): archaeological 14C dates in North America and their paleoenvironmental context. Radiocarbon 53: 371–394. Grimm, E C (2008). Neotoma: an ecosystem database for the Pliocene, Pleistocene, and Holocene. Illinois State Museum Science Papers E: 1. Morlan, R (1999). Canadian archaeological radiocarbon database: establishing conventional ages. Canadian Journal of Archaeology 23: 3–10. Stuiver, M and Polach, H A (1977). Discussion; reporting of C-14 data. Radiocarbon 19: 355–363. Trumbore, S E (2000). Radiocarbon geochronology In: Noller, J S, Sowers, J M and Lettis, W R eds. Quaternary geochronology: Methods and applications. Washington DC: AGU, pp. 41–60.